Decided to take some time off writing during the holiday break. Been off work for two weeks and just chilled and ate and ate and ate. I start work tomorrow so I’ll be getting back to my old routine. Oh and even though I haven’t posted I do continue to have my coffee 😁. The holiday season is basically over and it really hasn’t been a hot topic of conversation since the early part of the xmas period but I want to throw in my 2 cents on the ‘Baby it’s Cold Outside’ lyric controversy. My post will be short and sweet. Depending on your thoughts on it, it might not be sweet for you. Per the so called experts, when you read the ‘Baby it’s Cold Outside’ lyrics through today’s lenses they are deemed inappropriate. That’s right. Different time. Different lenses. I am not going to write that I did significant research but I wonder if these folks that have issues with these lyrics take the time to listen to today’s musical artists, regardless of their genre to see how many songs contain inappropriate, sexist and mysogenistic lyrics. Like selective memory maybe these folks use selective lenses? Anyway, I could have taken the time to list a few here but no need to. Google it. Works like a charm 😁👍. This entry was posted in This and That and tagged baby, christmas, cold, lyrics, outside. I JUST DO NOT GET THIS!!! i cannot understand people. You will never ever convince me that it makes sense to leave a baby in a car EVEN if it was sound asleep!!! Beyond words!!! This entry was posted in This and That and tagged baby, car, cop, save baby, sledgehammer. How are some people allowed to be parents? This entry was posted in This and That and tagged baby, dad, daughter, hot car, murderer, revive. This entry was posted in This and That and tagged baby, baby news, celebrity, chrissy, john, legend, news, teigen. 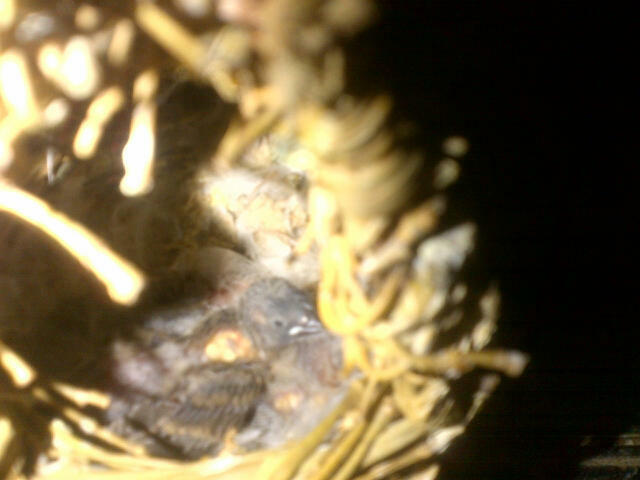 This is one of I believe three baby finch in the nest. I say, I believe there r three because at first I was sure now I only see two. Anyway looks like they will be of the dark variety. We have zebra and society finch… These babies are zebra. This entry was posted in This and That and tagged baby, birds, finch.